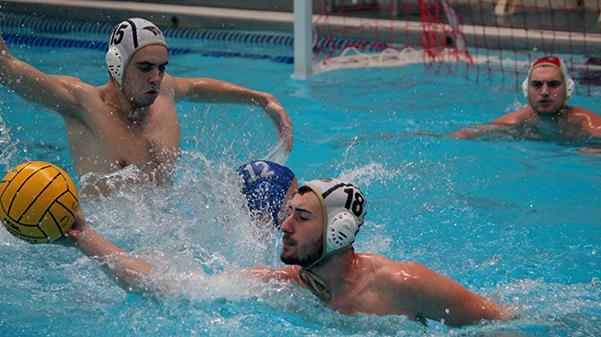 In a file photo from 2017, Lindenwood men's water polo player Jamie Gambin (15) assists Nikola Vukic (18) with a steal from a St. Louis University defender as Lindenwood goalie Sam Beckwith waits in the background for a possible shot. The men’s water polo team advanced to nationals last weekend after winning the conference championship for the seventh time in a row. The Lions defeated the University of Missouri and Washington University on Saturday, Oct. 13 to win the Missouri Valley Division Championship tournament and earn a ticket to the 2018 Collegiate Water Polo Association nationals in November. Lindenwood overpowered Mizzou with a 24-5 score and defeated Washington 14-6. 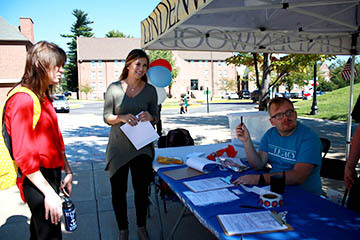 Lindenwood has won three national titles in a row but were upset in the first round of last year’s nationals and ended up ninth in the country. The Lions will look for their fourth national title in the last five years at the 2018 CWPA Men’s Division I Club Championship November 9-11 in Phoenix, Arizona.